From October 7 until November 8, I was fortunate to document the lives of two local mixed martial arts (MMA) fighters, Ricardo Lamas and Chris Martins. During this month I gained a new appreciation for MMA, which is the fastest growing sport in America among young males. From the outside the gym looks like a garage. Inside, perched near the rafters sits Macario “Mac” Ramos behind his computer. With a couple clicks of his mouse, hip-hop music is pumping from the speakers and a Ricardo Lamas fight video is playing on his screen. Mac is the director of this old school gym called Top Notch, located in Elmhurst, a Chicago suburb. Lamas, of Cuban and Mexican heritage, is perhaps Mac’s top mixed martial arts fighter. Mac, born in the Philippines, has more than a dozen different flags hanging high on the gym’s walls and representing the backgrounds of the fighters who train there. This gym is the fruit of many years saving money and dedicating himself to mixed martial arts (MMA), in particular Muay Thai. Top Notch has attracted some of the best trainers and coaches in the Elmhurst area due to its open and honest atmosphere. While fighters train around lunchtime, Mac and other coaches have paying students in the afternoons and evenings, which include women and homemakers. Chris Martins blocks a kick from Ricardo Lamas during their fight on Nov. 8 at UIC Pavilion. Meanwhile, in the downtown Chicago area, Chris Martins trains at the Valko Brazilian Jiu-Jitsu Academy. This gym, located on the fourth floor of one of the city’s largest personal training buildings. Jay Valko, a jiu-jitsu black belt, is the director of this academy situated in a modern gym with a view of the Sear’s Tower outside the window. Like Mac, he is well-respected in the mixed martial arts community. Gyms like these provide fighters like Lamas and Martins with the proper structure and guidance for mixed martial arts fights. Time management is a necessity for any MMA fighter, but is even more essential for Lamas and Martin. 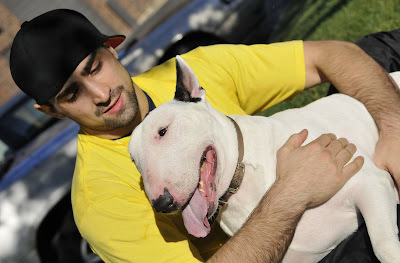 Lamas, 25, is nicknamed “The Bully” due to his dominant fighting style and the fact that he owns a 3-year-old English Bullterrier named Chico. Yet he doesn’t have as much time as he’d like to spend with Chico. His mornings are spent working as a personal trainer. Then he boxes, kicks, runs and lifts at Top Notch. He then drives to wrestling practice at Elmhurst College, where he is an assistant coach. During the evening he works on his jiu-jitsu with Jeff Neal in Naperville. He returns home at 10 p.m. He trains six or seven day per week, totaling about 25 hours. His biggest challenge is finding time to eat, so he takes protein shakes and vitamins and supplements. Ricardo Lamas with his 3-year-old English Bull Terrier named Chico sitting outside the gym where he trains called Top Notch in Elmhurst, IL. Martins, 23, says taking the time to eat is his biggest challenge as well. To makes matters more challenging, it disrupts his studies. Martins is in his second year at DePaul Law School, and never seems to have more than an hour or so to study before he has to eat, workout, or go to class. So why put yourself through this grueling schedule, which includes getting punched and kicked in the face for very little pay if any? For people like Martins, who grew up watching the movie Bloodsport with his uncle, the possibility of fighting in the Ultimate Fighting Championship is a dream. Just fighting Lamas at the IronHeart Crown XII, one of Chicago’s premier MMA events, a couple weeks ago was a huge honor and great way to get noticed by sponsors and fight promoters. For Martins it has meant serious sacrifice since he began at age 16 in Boca Raton, Florida. He stopped going to the bars with his fake ID, and alienated many of his friends, practicing jiu-jitsu rather than partying. He competed in every jiu-jitsu tournament he could and won many medals. Martins also began getting in many street fights. Normally, a non-confrontational, small kid, he had a new way of dealing with people who “disrespected” him. For an entire year, at age 17, he constantly got in street fights. He then matured and hasn’t gotten in a street fight since he was 18. By then he had already begun training to be a mixed martial artist, practicing Muay Thai, boxing, and wrestling. After graduating from a small private university in Florida, Martins moved to Chicago to pursue his plan B. Plan A is still the desire to be a big-time fighter. But his mother, a single Brazilian woman who raised Chris and his younger brother and sister, always drilled into his head the importance of having a plan B, or in this case, DePaul Law School. Coincidentally, one of the guys practicing jiu-jitsu at his gym in Florida was a partner at one of the largest class-action law firms in America. He offered Martins a job in the file room, and it was there that Martins developed an interest in the law. Because his first year of law school was so demanding he only had time to train for one MMA fight, over Christmas break, in which he won. This year he began training with Jay Valko, who says he has made dramatic strides in his overall fight game. 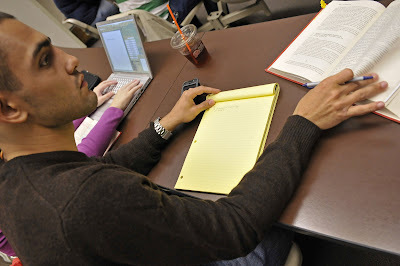 Chris Martins taking notes during an intellectual property class. Martins is in his second year at DePaul Law School. Martins’s opponent, Ricardo Lamas, has more fight experience with a record of 9-0 since turning pro in November 2006. His passion for the sport, like Martins, is a coach’s dream, according to everyone who trains him. Unlike Martins, however, Lamas was a troublemaker as a child. Maybe it was the fact his five older brothers picked on him. Lamas says his parents got him involved in sports because he was so hyperactive. Nevertheless, Lamas loved to fight, and after watching a bunch of Bruce Lee movies, he began taking taekwondo classes. When he watched the UFC he liked the idea of one-on-one competition with no one to help you. Lamas wrestled throughout high school in Oak Brook, but it wasn’t until he attended Elmhurst College that he became a dominant wrestler at 157 pounds. During his senior year, he couldn’t practice for two weeks before the national tournament because he had a dislocated shoulder. Despite basically wrestling with one arm, Lamas wrestled his way into the All-American round. This competitive spirit helped him advance at such a rapid rate since his first MMA fight in January 2007. This month Lamas and Martins, fighting at 155 pounds, had perhaps the best fight at the IronHeart Crown XII, which was the first officially sanctioned MMA event in Chicago, held at the UIC Pavilion. Knowing Martins was a jiu-jitsu specialist, Lamas tried to win with his striking ability. Ricardo Lamas trying to punch Chris Martins during their fight on Nov. 8 at UIC Pavilion. Lamas won by unanimous decision. It was the first mixed martial arts event in Chicago since the state athletic commission lifted its ban on July 1, 2008. Both fighters exchanged blows to the applause from the crowd. In the end, Lamas’s experience helped beat Martins in a unanimous three-round decision. These two young fighters are two examples of where the sport is and where it is heading. Yet, many people choose MMA for reasons beyond the pro fight scene. The ironic part is that good fighters such as Lamas and Martins have very little time to look for trouble because they are always training. They also have learned to have a respect for others that mixed martial arts teaches. This story appeared in the Chicago Sports Review magazine. Great story, I like the detailed and bio's on individual fighters.